The volume is co-published by the Winchester Excavations Committee and forms Volume 11 of the Winchester Studies series. 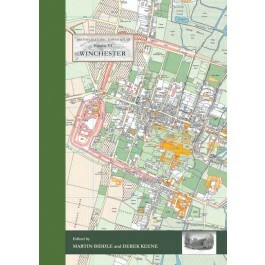 Following the success of volumes IV (Windsor and Eton) and V (York) in the series of Historic Towns Atlases, the new volume maps and explains the history of Winchester — a city which has played such an important part in English history from Roman times onwards. Combining many full-colour maps with an authoritative but very readable text, the atlas shows how the Roman city of Venta Belgarum became the second-most important city in England for several centuries, a walled town, the seat of kings and an ecclesiastical centre almost unparalleled in the country before gently declining into a judicial centre and county town. The atlas is centred on a detailed map of the city at the scale of 1:2500, showing Winchester's historic buildings and structures on a map of the city as it was in 1800. A series of maps show how Winchester was at key points in its history, charting its development and changing shape. The atlas includes an early OS map, modern maps and historic aerial photographs, as well as colour illustrations, many of which have never been published before. The introduction offers a full history of how and why Winchester developed from prehistoric times onwards, in a series of chapters written by historians but aimed at the general reader. It also includes a comprehensive reference gazetteer listing every place shown on the maps, with a map location, a brief history, and further reading for those interested in finding out more. Like its companion volumes, the maps, text, gazetteer and illustrations are presented in an A3 stiff card binder, and the format allows for maps of different date to be compared side-by-side. "The maps and illustrations are fortified by nine brilliant essays. But to me the most valuable part of the atlas, apart from the maps, is the gazeteer… In short this splendid Atlas whets the appetite for that dealing with Oxford."